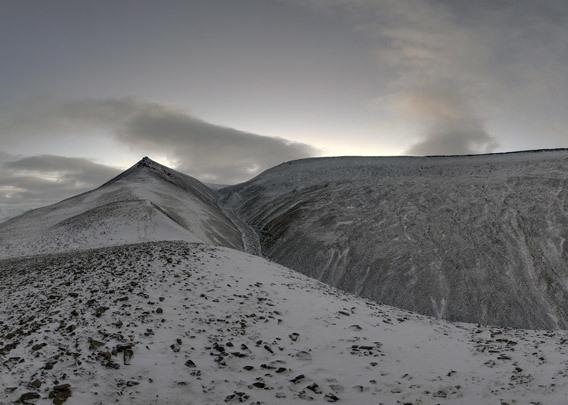 This panorama shows the landscape not far from Longyearbyen, viewing over Adventdalen from the slopes of Lindholmhøgda, next to Gruvedalen. We get an impression of the light conditions as they are around noon in mid November. The sun has been below the horizon already for several weeks, it does not rise anymore at all. The impression that this panorama gives is actually almost a bit too bright, but on the other hand, orientation is not that difficult once you have got used to the light conditions at least when the sky is clear. At the time of this photography, in mid-November 2017, there was very little snow in the landscape, not at all enough for skiing, let alone for driving a snowmbile.